Although I am no longer selling the bread and rolls commercially, I am however, offering the license, recipes and training for the items at a reasonable rate. This is a good option for those who love the product and have experienced the wonderful health benefits as a result. This bread is very rich in Vitamin E and contains other vital nutrients and vitamins. It is made of organic wheat or spelt. 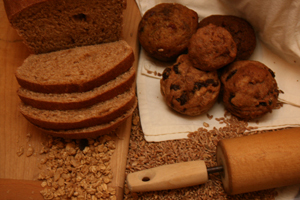 The berries are milled into flour and the bread is then immediately baked to prevent loss of nutrients. If the flour is not used after two days, all nutrients are void. This is because of the life (wheat germ) in the freshly milled wheat or spelt. Once the bread is baked, the nutrients are preserved. The product can be stored in the freezer until ready to use without losing the vital nutrients. It is truly ‘The Bread of Life’. The bread on the store shelf is void of nutrition because the wheat germ (life) of the berry has been removed. This allows industry to mass produce large quantities of bread at one time. This is convenient, but not healthy. Lastly, but certainly not least, the bread is quite delicious. From the whole wheat to the various varieties and flavors, it is a favorite in everyone’s household. Since it is so satisfying and nutritious, it quickly becomes a ‘main-stay’ in every house. Click on a link below to share in these delicious, nutrient-rich products!